The following footage has been recorded from the LiveCam on January 15, 2019 and shows a UFO flying at a high speed through space during a fascinating display of an aurora borealis also called the northern lights. Compared to cigar-shaped UFOs this UFO seems to have a kind of square structure across the rear end of the craft. Over the years it has been proven that more UFO observations have been reported of cigar-shaped or cylindrical UFOs than any other type of alien craft. 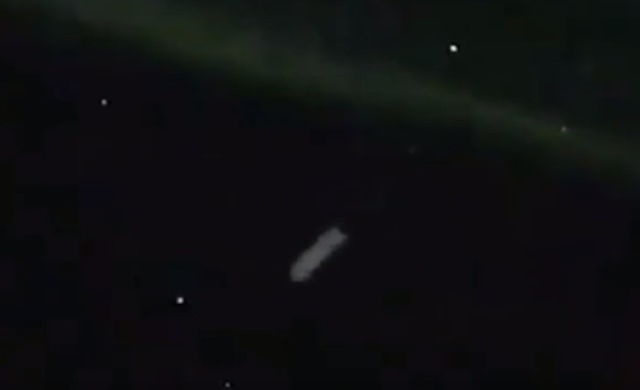 Great vid of the Aurora but might the object be a piece of space junk? It's hard to estimate size with no perspective.